Whoopi Goldberg has partnered with Maya Elisabeth to create a company that manufactures products to help women find relief from menstrual cramping. Whoopi has suffered for years with “horrific menstrual cramping,” and her daughter and two granddaughters have inherited this symptom as well. She is a passionate supporter of marijuana to help give relief. The company, called the Whoopi and Maya Line, will sell four marijuana-infused products: balm, sipping chocolate, a tincture and a bath soak. The chocolate will include both THC and CBD, and the bath soak will contain THC only. Whoopi’s company will sell the first marijuana products to target women’s menstruation symptoms. Goldberg began the project after finding that none of the other advertised products offered her any relief. However, she discovered that marijuana companies were not open to her idea, claiming that it was “too niche a market,” so she began the venture independently with her friend. Whoopi has been a big proponent and supporter of medical marijuana for years. In 2014, she wrote in The Cannabist that she was thrilled New York Governor Andrew Cuomo would allow people to use medical marijuana to get help needed for relief. She did say, however, that the governor’s plan did not consist of helping women with menstrual cramping, glaucoma sufferers or individuals who deal with migraine pain. 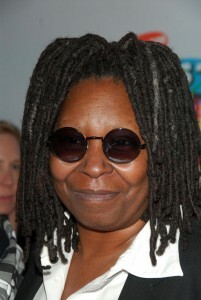 Analysts believe Whoopi’s products will be a big hit. A 2012 survey found that nine out of ten women suffer from dysmenorrhea. Four out of ten experience such severe cramping that they’ve had to take off of work. Whoopi says that her products will not make users high, instead focusing on providing pain relief. She also claims that they are handy and can be kept with a woman at all times to bring relief whenever (and wherever) needed.